Hypopigmentation on face after IPL, what product should I use? Hi I have a question what dermaroller/dermastamp is best suited for hypopigmentation spots in the face after an IPL treatment. 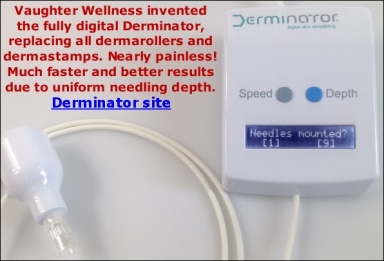 In my country I found a way to order 0.5 mm dermarollers and 1.5 mm dermastamps is this a good combination? I forgot to ask do I need any specific cremes or serums to put on the skin after treatment with dermarollers? The dermatologist told me to avoid sun exposure for the coming 2 - 4 months after the treatment I had two days ago. Can I still use dermaroller? Or does it have no use as the sun/tanningbed would need to encourage the cells to produce melatonin? My last question is how long can I keep a dermaroller/stamp without using? Thankyou for your reply. Re: Hypopigmentation on face after IPL, what product should I use? I am not sure I understand your question. You had an IPL treatment two days ago and you already know it has left you with hypopigmented patches? That would be way too premature to judge.. You have to let the skin completely heal from the treatment first. Two months at least. You have to keep the rolled/stamped area moisturized. An unused dermaroller will basically last forever. Skin pigment (Melanin) is produced by melanocyte cells. They are at the bottom of the epidermis, whose thickness is 0.1 - 0.3 mm. When they produce too much Melanin in a certain area, you get hyperpigmentation. And when they do not produce enough or are destroyed or damaged, you get hypopigmentation. Scar tissue differs from normal skin and one of the differences is that it has no, or badly functioning pigmentation processes. Dermarolling often triggers the activity of melanocytes (pigment producing cells) or "wakes up" existing dormant melanocytes. In some cases the color turns completely back to normal (especially if there is hypopigmentation but no scar tissue, such as in Vitiligo for example) and in some cases the color improves but the scars remain still lighter than the surrounding skin. If you have hypopigmented patches, stamp them every 10-14 days with a 1 mm dermastamp. If you have a hypopigmented, hardened scar or if it is on an area with thick skin (such as the knees), use a 1.5 mm dermastamp. Stamp the hypopigmented patches and also stamp slightly outside of its borders to enable the migration of melanocytes from the surrounding normal skin into the hypo-pigmented areas. Large hypopigmented areas: Roll up to three times a week with a regular 0.5 mm dermaroller. Roll over the hypopigmentation and roll further to normally pigmented skin to hopefully "harvest" some melanocytes and then roll back over the hypopigmentation. Ideally, combine rolling with stamping of the most hypopigmented patches. When the skin is healed from microneedling, expose your hypopigmentation to the sun because Melanin is produced as a reaction to UV (provided there are melanocyte cells in the area to produce it).